Here is Part Three of Beth’s Beauty Within series. Once again, I’m late posting this. I have a feeling this will probably happen again as I get closer to having this baby 🙂 Regardless, this is a great article! Please read and share. Beth has some wonderful insight the Lord has given her. If you missed the other parts of the series, click the links below to go back and read them. I haven’t really figured out why people paint over wood. I mean, I understand if the wood is damaged beyond repair. When there is a beautiful treasure hiding under years of paint and neglect, then I wonder why? Sometimes, I think it is because we have all come to the place where we want quick fixes and we don’t want to work hard at something anymore. I think of the movie Wall-e, where the people become so lazy that all they do is float around in chairs and get fat while eating food. Everything is handed to them so why try. the inside, I found a screwdriver, a few guitar picks, some loose change, a few broken keys, It was severely out of tune. This was not something that would take overnight to fix. I did not have the miracle of Hollywood to transform this from its broken place to being fully restored. Even after we were put it back together, it still needed time to exercise the strings, to allow the piano man to properly tune it. To tune it alone takes a week at least. Needless to say, you cannot be in a rush for any of this process. This is also true in our walk with the Lord. It takes time. Putting off the “old man” is a process. God usually starts us off with something like we see in this scripture. In my case, when I had my life-changing encounter with God, I stopped drinking overnight and did not touch alcohol for over 14 years. This does not mean I never touched it again. No, I did drink again, for a season. During that season, I was no longer using the alcohol as a medication to take away my pain. I am in a new place, and it is my choice not to drink again. But just like we have to change our clothes, we have to take off the “old man.” God will help us to repent from our old habits, thought processes and to overcome the attitudes in our life that hinder us. Yet we must also choose to put on the new man. How do we know that we have the new man working in our lives? Well, that is measured by the fruit we have. God says people will know who we are when they see our fruit. What is fruit, you say? There is an evidence of change in us when we allow these fruits to grow. Fruit takes a season to grow. When first planted, fruit trees do not normally produce fruit until the tree is at least five years old. It takes time for us to mature and for the fruit to grow. In my life the hardest fruit for me to grow was self-control. I am in the process of learning how to overcome this, it has been a long season. As I allow these fruits to develop in my life, I have found there is often a little nugget of wisdom along the way. 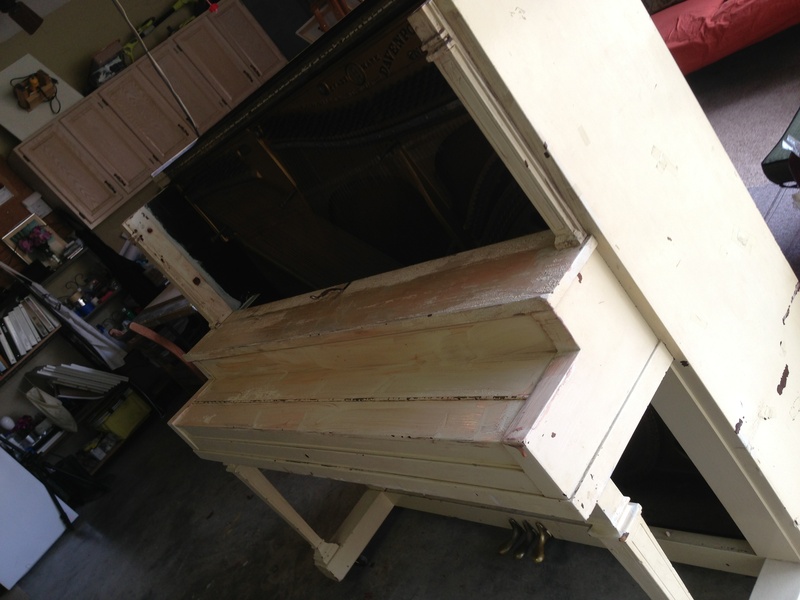 As I worked on my piano, I began to see the treasure that was hidden underneath all the paint and old varnish. It was more beautiful, than I thought it would be. I was surprised to find many types of wood that were used to make this one piano. It was truly a beautiful treasure. It had to be taken apart into pieces before we could complete the whole process-before the new could be put on. It was now ready to give it new life and restores it’s parts to make it whole again. You will hear about this in the last part of this journey: The Rebirth of a Dream – Shining His Glory. 03 Aug	This entry was published on August 3, 2013 at 5:16 pm. It’s filed under Thursday's Thoughts and tagged beauty within, devotionals for women, encouragement for women, inner beauty, old to new, piano restoration, WhoIsBeautiful. Bookmark the permalink. Follow any comments here with the RSS feed for this post.